At Hyman Bros. Kia, we believe that it is our duty to keep our neighbors in Midlothian informed about their vehicles. 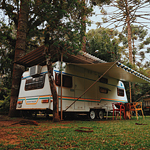 As the warmer months approach, we are particularly concerned with ensuring that everybody knows how to prepare their vehicle to tow a camper. With this in mind, we have put together a brief guide for you to review. One of the first things that you will need to do before leaving to go camping is to ensure that you have the right hitch. Hitch Class 1 can tow up to 2,000 lbs, Hitch Class 2 can pull as much as 3,500 lbs, Hitch Class 3 is capable of towing up to 8,000 lbs, and Hitch Class 4/5 can tow a massive 18,000 lbs. Whatever you are pulling, make sure you have the right tool for the job. Of course, you should also do a quick check to make sure that you have everything that you need in your trailer and vehicle. In the trailer, you will need toiletries, bedding, and kitchenware. In the vehicle, you will need a flashlight, a first aid kit, and some tools to fix any problems you may encounter.